L'il Dee's Crafting with a Kitten: Inktense!!! All my new goodies I ordered last week arrived yesterday so I just had to spend some more time in my craft room tonight. I got a bunch of new Kraftin' Kimmie stamps, some of the new memento ink colors and a new pentel watercolor brush. So I decided to put away the copic markers for tonight and play with my inktense watercolor pencils. I have been wanting to try a project with them for awhile now. First of all I love my new watercolor brush, it has such a fine tip on it and I can get some great detail with it. I decided to use the Peony Kraftin' Kimmie stamp I got in my last order for this card. The challenge this week is a white on white card except for the main image. I wanted to do a really bright image and I thought the Peony stamp would work really well for that. I also got the chance to use my new Spellbinders M-bossabilities folder "splendid" for this card. I made a white card base then cut a white layer to emboss. Then I cut out a white scalloped oval and plain oval with spellbinders petite scalloped and petite ovals large. I edged everything with a pixie dust chalk ink just to give them a little bit of definition. I stamped Peony with ranger black archival ink and then colored her with the watercolor pencils. I then went over the image with the aqua brush to blend all the colors together well. I also colored over the bow in her hair with a sakura clear stardust pen. I cut the image out and glued her to the middle of the oval and then attach to card with 3d foam dots. I then added really tiny white pearls to the centers of all the embossed flowers visible. Well now I have to wait a whole week for the next challenge LOL! I guess I'll have to go find some other challenges to do later this week. I am happy I did manage to get my three posts up for this week, that makes up for only one last week. Have a very Happy Canada Day everyone!!!! I hope the weather is better tomorrow so everyone can get out and enjoy the festivities. I'll be back in a couple of days with another post. Thanks for stopping by my blog and until next time happy crafting everyone!!! 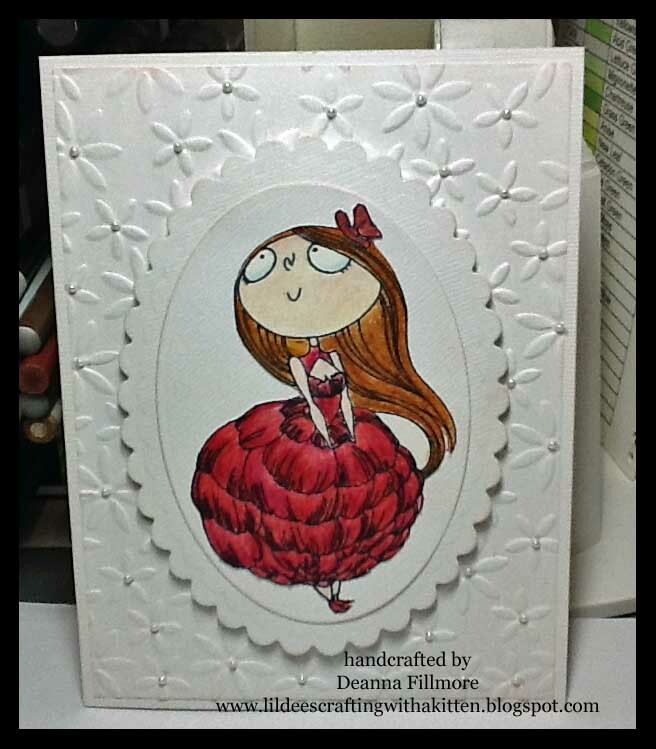 Deanna, your card is gorgeous!! I love your use of Peony, isn't that a great stamp? Wonderful job and thanks so much for playing along with Kraftin' Kimmie!! Good luck! !